They say Dolly Madison introduced ice cream to America. When she first served it at the White House she probably hoped it would become popular, but she never dreamed of the big plants and automatic equipment that now produce thousands of gallons and dozens of flavors. Most likely milk and cream were delivered to Mrs. Madison in a pail. Now big tank trucks 1 bring them to the plant. She had to use milk right away to keep it from spoiling, but today refrigeration and insulation, like Armstrong’s Corkboard, around the trucks and storage tanks 2 keep it fresh. In an ice cream plant, sugar syrup is stored 3 then weighed with the milk and cream 4, mixed together 5, and pasteurized 6 with 160° F. steam. To keep steam hot the pipes that bring it from the boilers 7 are covered with 85% Magnesia insulation. The pasteurized mix 6 is now homogenized 8, cooled 9 to just above freezing, and stored 10. Mix for bulk ice cream is flavored 11 and partially frozen 12. The refrigerant at 30° below zero supplies the low temperatures for all the refrigerated equipment. This refrigerant is made cold by compressors 13 and kept cold by Armstrong’s Cork Covering on the pipes that carry it. Fruit or nuts are added as the ice cream pours into containers. Then it is frozen 14 and stored 15. Both rooms can be held at 20° below zero because the walls, floors, and ceilings are built with Armstrong’s Corkboard. Ice cream rolls 16 and fancy packages of ice cream 17 are formed then wrapped. Ice cream on a stick 18 is frozen in molds by 50° F. below zero brine, then dipped in hot chocolate. Like bulk ice cream these products are hardened 14 and stored 15. Handling ice cream requires special equipment that’s well insulated to prevent thawing. So the delivery trucks 19 and the retail storage cabinets are insulated with Armstrong’s Corkboard and Fiberglas. 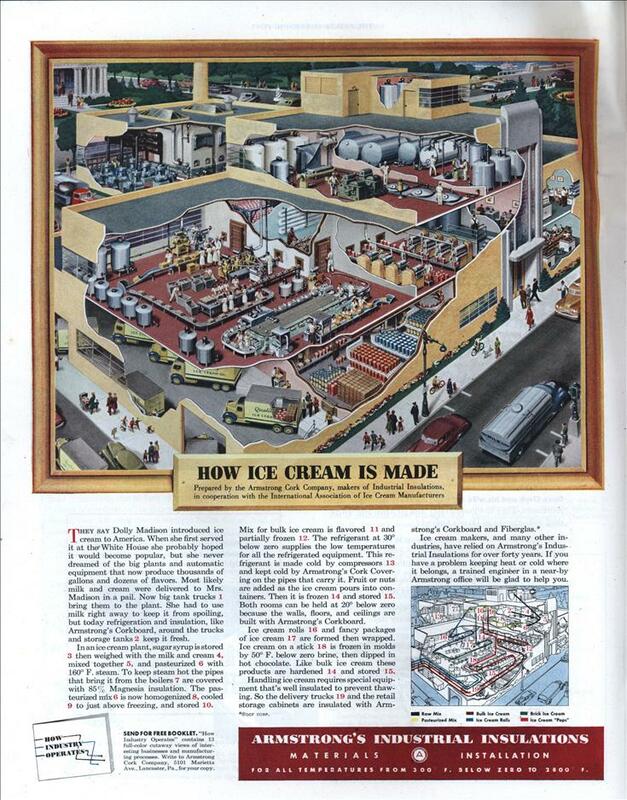 * Ice cream makers, and many other industries, have relied on Armstrong’s Industrial Insulations for over forty years. If you have a problem keeping heat or cold where it belongs, a trained engineer in a near-by Armstrong office will be glad to help you. INSTALLATION FOR ALL TEMPERATURES FROM 300 F. BELOW ZERO TO 2800 F.
Pure corporate propaganda, heres the real “scoop”! Hiru, I can’t believe I laughed at that. And yet I did.